It was the middle of winter and the electricity had been knocked out by an ice storm. As we listened to our battery-powered radio the announcer said, “The following churches will be closed due to lack of power.” What a provocative statement! What would the announcer say about many American churches today? They probably wouldn't be closed for lack of activity, but lack of power is another matter! Vance Havner - We are seeing much today of service without the Spirit. There is an appalling ignorance of the Person and work of the Holy Spirit in our great church bodies. It is not what is done for God that counts, but rather what is done by Him, the work of His Spirit through our yielded wills. Programs, propaganda, pep, personnel, these are not enough. There must be power. God's work must be done by God's people God's way. The Quakers got their name from the fact that they trembled under the power of the Spirit. At least their faith shook them! Too many of us today are shaky about what we believe but not shaken by what we believe! Too many people assemble at God's house who don't really believe in the power of God. Having begun in the Spirit, we live in the flesh (Gal 3:3)… Never has the church had more wire stretched with less power in it. All is vain unless the Spirit of the Holy One comes down (cp Zech 4:6). Sad to say, we seem not even to know that we have not the Spirit in power. If He ceased His work many church members would never know the difference. Like Samson, we don’t realize that He has departed (Jdg 16:19, 20, 21), but we keep "shaking ourselves" in the prescribed calisthenics. And I, I’m lost without You! And so this overview on the Spirit Filled Church hopefully will transmit some information, but it will be for naught if it does not bring about Spirit wrought transformation for that is the desperate need of the body of Christ in these last days! The preacher and teacher can (and should) preach and teach the Word of Truth, but only the Holy Spirit can impart and implant that Word into the fertile soil of our hearts! CAVEAT/DISCLAIMER - The mere mention of the Holy Spirit may send shivers down your spine! Questionable practices and emotional extremes in the Name of the Spirit by some have caused many believers to shy away from the Holy Spirit and to become coolly intellectual – espousing orthodoxy but without true orthopraxy! In so doing these orthodox saints have essentially neglected the vital, necessary role of the Spirit in a Spirit filled church. The enemy is undoubtedly quite pleased that many in the Body of Christ are firmly entrenched in one of these two polarized camps -- either fully fanatical or insipidly intellectual! I believe the Scripturally defined "middle ground" is where God wants His church and the goal of this message is to outline the Scriptural pattern of a Spirit filled church. A C Dixon - When we rely on organization, we get what organization can do. When we rely upon education, we get what education can do. When we rely on eloquence, we get what eloquence can do. But when we rely on the Holy Spirit, we get what God can do. Let’s drop the plumb line of God’s Word to determine the truth about the Spirit Filled Church (and we are just scratching the surface). Any ministry that exalts the Spirit at the expense of exaltation of Jesus Christ is clearly in error for our Lord Himself stated that the Holy Spirit "shall glorify (doxazo = give a correct opinion or correct estimate of Jesus) Me; for He shall take of Mine, and shall disclose it to you." (John 16:14). Jesus explained that "When the Helper (parakletos = the Holy Spirit) comes, Whom I will send to you from the Father, that is the Spirit of truth Who proceeds from the Father, He will testify (martureo = bear witness of the truth) about Me (Not primarily about Himself)." (Jn 15:26) The Westminster Shorter Catechism asks "What is the chief end of man?" and answers "Man's chief end is to glorify God and to enjoy Him for ever." The chief end of the Spirit of Christ Who indwells every believer (Ro 8:9-note, Ro 5:5-note) is to glorify the Lord Jesus Christ through us, not to glorify Himself! So let's begin with the "birthday" of the Christian church in Acts 2. Bethlehem was God with us. Calvary was God for us. Pentecost is God in us. Acts 4:29 "And now, Lord, take note of their threats, and grant that Thy bond-servants may speak Thy word with all confidence (boldness - parrhesia), 30 while Thou dost extend Thy hand to heal, and signs and wonders take place through the name of Thy holy servant Jesus." 31 And when they had prayed, the place where they had gathered together was shaken, and they were all filled with the Holy Spirit (the fact that this is repeated shows that Acts 2:4 filling was not permanent, one time event), and began to speak the word of God with boldness (parrhesia) (affects speech). 32 And the congregation of those who believed were of one heart and soul (creates unity); and not one of them claimed that anything belonging to him was his own; but all things were common property to them (stimulates generosity). 33 And with great (megas) power (dunamis) (Note not just power but great power! God's answer reminds us of Eph 3:20-note where we Paul reminds that that He "is able [see God is Able] to do exceeding abundantly beyond all that we ask or think, according to the power [What power? Not an impersonal Power, but a power providing Person, the Spirit!] that works [energeo in present tense = continually "energizes"] within us!" Do we really believe this?) the apostles were giving witness to the resurrection of the Lord Jesus (fulfillment of Acts 1:8-note), and abundant grace (charis) was upon them all. (8) They will experience abundant grace (charis). Before Pentecost, the disciples were like rabbits. After Pentecost, they were like ferrets! Indeed "Peter the denier" (Jesus = Mt 26:34, Peter's 3 denials =  Mt 26:69-70,  Mt 26:71-72,  Mt 26:73-74) empowered and emboldened by the Spirit was supernaturally transformed into "Peter the Proclaimer!" 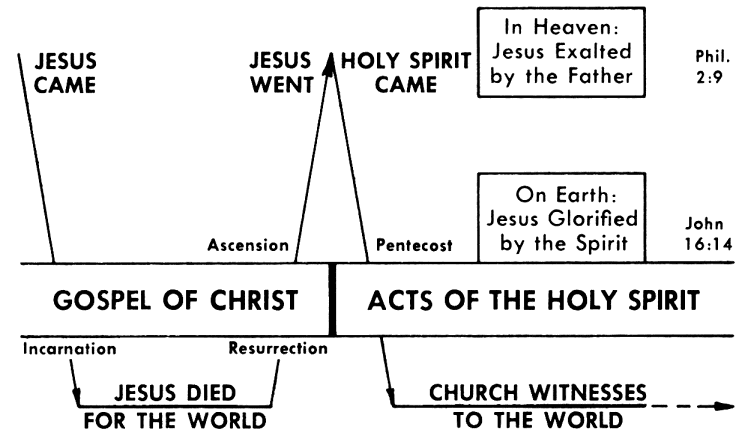 (Acts 2:4,14, 36-38, Acts 4:8 = "Peter filled with the Holy Spirit"). Before Pentecost the disciples found it hard to do easy things; after Pentecost they found it easy to do hard things. Pentecost was a once in a lifetime occurrence, that "changed everything." And remember that if Pentecost was never repeated, neither is it retracted. In other words, despite the passage of 2000 years, we are still in the era of the Holy Spirit and the Spirit filled church! The potential is there for every church to be empowered by the Spirit to glorify the Name of Jesus (cp Jn 16:14)! STEPHEN - Acts 6:3 "But select from among you, brethren, seven men of good reputation, full of the Spirit and of wisdom, whom we may put in charge of this task… 5 Stephen, a man full of faith and of the Holy Spirit… 7 And the word of God kept on spreading; and the number of the disciples continued to increase greatly in Jerusalem, and a great many of the priests were becoming obedient to the faith. 8 And Stephen, full of grace and power, was performing great wonders and signs among the people… Acts 7:55 But being full of the Holy Spirit, he (Stephen) gazed intently into heaven and saw the glory of God, and Jesus standing at the right hand of God… 60 And falling on his knees, he cried out with a loud voice, "Lord, do not hold this sin against them!" And having said this, he fell asleep. Spirit filled believers (like Stephen) are supernaturally empowered to be witnesses of Jesus Christ (Acts 1:8), shining brightly even before those who are filled with hatred (Acts 7:58, 8:1 = Saul/Paul) Spirit filled believers are supernaturally enabled to forgive even those who persecute them! Finally note that being filled with the Spirit enables one to die with a peace that surpasses human understanding. SAUL/PAUL - Acts 9:17 (Three days after Saul/Paul's conversion) And Ananias departed and entered the house, and after laying his hands on him said, “Brother Saul, the Lord Jesus, who appeared to you on the road by which you were coming, has sent me so that you may regain your sight, and be filled with the Holy Spirit.… 20 and immediately he began to proclaim Jesus in the synagogues, saying, “He is the Son of God.”… 22 But Saul kept increasing in strength and confounding the Jews who lived at Damascus by proving that this [Jesus] is the Christ. BARNABAS - Acts 11:22-24 And the news about them reached the ears of the church at Jerusalem, and they sent Barnabas off to Antioch. Then when he had come and witnessed the grace of God, he rejoiced and began to encourage them all with resolute heart to remain true to the Lord; for he was a good man, and full of the Holy Spirit and of faith. And considerable numbers were brought to the Lord. Comment: Spirit filled believers like Barnabas encourage the church to "to remain true to the Lord with a firm resolve of the heart." PAUL - Acts 13:9-10 But Saul, who was also known as Paul, filled with the Holy Spirit, fixed his gaze upon him, and said, "You who are full (what a dramatic contrast full of the Spirit vs full of deceit!) of all deceit and fraud, you son of the devil, you enemy of all righteousness, will you not cease to make crooked the straight ways of the Lord?" Acts 13:52 And the disciples were continually filled (pleroo in the imperfect tense = over and over filled) with joy and with the Holy Spirit. (cp "joy of the Holy Spirit" = 1Thes 1:6) Acts 14:1 And it came about that in Iconium they entered the synagogue of the Jews together, and spoke in such a manner (Spirit empowered) that a great multitude believed, both of Jews and of Greeks. 2 But the Jews who disbelieved stirred up the minds of the Gentiles, and embittered them against the brethren. 3 Therefore they spent a long time there speaking boldly (enabled by the Spirit) with reliance upon the Lord, who was bearing witness to the word of His grace, granting that signs and wonders be done by their hands. What is a Spirit filled church? A Spirit filled church was the normal experience for the church in Acts and is to be the expected experience of every church of every age! And so in simple terms a Spirit filled church is composed of Spirit filled believers, irrespective of their position in the church or their degree of maturity. Every believer has received the Holy Spirit at the moment of regeneration, for as Paul explained "you are not in the flesh but in the Spirit, if indeed the Spirit of God dwells in you. But if anyone does not have the Spirit of Christ, he does not belong to Him." (Ro 8:9-note, cp 1Cor 6:19-note) So the moment we were born again by the Spirit, the Spirit comes in as resident, but when we allow (yield, surrender to) Him to fill (control) us He becomes "president" so to speak! In other words, the Spirit comes not just to reside in us, but to preside over us! As Wayne Detzler says "The Christian church can only adequately fulfill its function in the world when every member knows this Spirit fulness." God has sovereignly made His provision available. Our responsibility is to make His place available. Are you willing to allow Him to preside and to guide your life? Your answer determines whether you will experience His filling or not! And remember, Scripture teaches that when we believed we received all of the Spirit we will ever possess. The question now is how much of each of us will He possess (fill, control) each day? It is one thing for you to have the Holy Spirit. It is another thing for the Holy Spirit to have you! Ephesians 5:15-note Therefore be careful (present imperative = command calling for this to be their lifestyle - something only possible as we yield to the Spirit) how you walk, not as unwise men, but as wise, 16-note making the most of (exagorazo in present tense = continuously redeeming) the time (kairos), (why?) because the days are evil (poneros). 17-note So then do not be foolish, but understand (suniemi in the present imperative) what the will of the Lord is. 18-note And do not get drunk (methusko) with wine, for that is dissipation (asotia), but be filled with the Spirit, 19-note speaking (present tense) to one another in psalms and hymns and spiritual songs, singing (present tense) and making melody (present tense) with your heart to the Lord; 20 always giving thanks (present tense) for all things in the name of our Lord Jesus Christ to God, even the Father; 21 and be subject (present tense) to one another in the fear of Christ. Comment: Be filled in Eph 5:18 is not a suggestion, but a command (it is every believer's responsibility) in the present tense calling for Spirit filling to be our habitual practice, our lifestyle so to speak. It follows that no believer understands (or is in) the will of God who is not filled with His Spirit (Eph 5:17-note) The present tense also underscores the fact that filling is not a one time event but is a repeated action. The implication is that each morning we need to wake up with a sense of our desperate need for Spirit to fill us. The passive voice indicates this filling is not something we do, but something we allow the Spirit to do in us. Our part is to acknowledge our need and willingly surrender our will to the Spirit. I would add that given that the Spirit is Holy, we also need to "keep short accounts" and continually confess our sins when He brings them to our mind (1Jn 1:9-note where confess = present tense = as our lifestyle, our habitual practice). Finally, the verb be filled is in the plural which indicates this command applies to the entire church (as we say in Texas it applies to "Y'all"). Every church (and every member) is to be a Spirit filled church. To not be Spirit filled is to disobey God's command, which of course is a sin! Charles Swindoll - I don’t know of a more important verse in the New Testament for the Christian than Ephesians 5:18—honest, no exaggeration. This verse tells the believer how to live an authentic, empowered life. (1) The members are continually speaking to one another in psalms and hymns and spiritual songs. As an aside, this "fruit of filling" enables one to discern whether he is filled with the Spirit, for out of the mouth comes that which fills our heart (cp Mt 12:34). When the Spirit fills (controls) our heart, wholesome speech proceeds from our mouth. On the other hand, when unwholesome speech proceeds from our mouth (Eph 4:29-note), we can be know that we have grieved the Spirit (Eph 4:30-note) and at that moment are not controlled by Him, but by our sinful flesh! How were your words today? If unwholesome, then confess them to the Lord, so that you do not continue to grieve the Spirit. As an aside, there are some commentaries that combine speaking and singing (#2) as one effect, but in the Greek sentence these are separate and distinct participle verbs. Furthermore, when one compares the parallel passage in Col 3:16-note speaking in Eph 5:19 parallels "teaching and admonishing", which is is distinct from singing. (2) The members of the body continually sing and make melody with their hearts to the Lord. He is to be our audience to Whom we seek to please as we sing, not others in the body. (4) They are continually willing to submit themselves to each another in the fear of Christ. When we surrender to the Spirit, He will enable us to willingly surrender our right to be in control in every situation. Spirit wrought mutual submission in the body of Christ will be manifest by a Phil 2:3-4-note mindset (Doing "nothing from selfishness or empty conceit, but with humility of mind" regarding "one another as more important than" ourselves, not looking "out for [our] own personal interests, but also for the interests of others."). In short, such submission to one another is not natural but supernatural as the Spirit empowers each member of the body to have an attitude of humility and selflessness. (c) Understand God's will. (See related discussion - The Will of God). Comment: Note that each of the preceding verbs is plural which means Paul is addressing the entire church. In addition each verb is in the present tense which calls for these attitudes and actions to be our lifestyle, clearly something we can accomplish only supernaturally as the Spirit enables us! Note also that the effects of Spirit filling do not cease in Ephesians 5:21, but successively impact our marriages (Eph 5:22-31-note), our children (Eph 6:1-4-note), our workplace (Eph 6:5-9-note), our warfare (Eph 6:10-17-note), our prayer life (Eph 6:18-note) and our power be a bold witness of the Gospel of Jesus Christ (Eph 6:19-20-note). Too many believers forget that in every area of our life, we are continually in desperate need of the power of the Spirit, Who alone enables us to live as more than conquerors in Christ! Colossians 3:16-note Let the word of Christ richly dwell (present imperative = command to the entire church [verb is plural] calling for this to be their lifestyle = only possible as we individually yield to the Spirit giving us the desire and the power) within you, with all wisdom teaching and admonishing one another with psalms and hymns and spiritual songs, singing with thankfulness in your hearts to God. In summary, being filled with the Word is intimately related to being filled with the Spirit. The corollary conclusion is if you are not daily eating the Word or meditating on the Words you have memorized, you are not likely to be filled with and controlled by the Spirit. (cp John 6:63 where Jesus links the Spirit and the Word). Are you eating (e.g., inductive Bible study) and "chewing the cud" of (meditating on) the Word of Life daily? Spiritual health like physical health depends on adequate intake of good nutrition (cp Jesus' words in Mt 4:4, Job 23:12-note)! See discussion on the inestimable (and even eternal - see 1Ti 4:8-note) value of Memorizing God's Word. See online memory verse tool to aid your daily intake of the "bread of life" - Memory Verses by Topic. Charles Spurgeon once said that a Christian’s blood should be “bibline,” bleeding Scripture wherever he or she is pricked or cut (speaking figuratively of course)! Let’s test the hypothesis of filled with the Spirit and filled the Word by observing the example of Jesus. Remember that He emptied Himself when He became flesh (Phil 2:6-7-note) and one reason was that He would then give His disciples the example of how a godly man can live in this fallen world. In light of that truth, it is not surprising that believers are repeatedly instructed (even commanded) to follow Jesus ("Be [present imperative = continually] imitators… of Christ" = 1Cor 11:1, "be imitators… walk in love, just as Christ also loved you, and gave Himself up for us" = Eph 5:1-2-note; Christ left "an example for you to follow in His steps" = 1Pe 2:21-note, "walk [conduct yourselves] in the same manner as He Himself walked" 1John 2:6-note, ). Comment: If the Lord of glory was willing to submit to the Spirit for guidance, how can we not do likewise! (cp Gal 5:18-note, Gal 5:25NLT-note). Luke 4:14-15 And Jesus returned to Galilee in the power (dunamis) of the Spirit; and news about Him spread through all the surrounding district. And He began teaching in their synagogues and was praised by all. Comment: If Jesus' taught filled with and empowered by the Spirit, how can any teacher not be desperate to emulate His example, lest their teaching be wood, hay and stubble? Peter summarizes Jesus’ 3 year ministry in Acts 10:37-38 - "You yourselves know the thing which took place throughout all Judea, starting from Galilee, after the baptism which John proclaimed. You know of Jesus of Nazareth, how God anointed (chrio) Him with the Holy Spirit (cp Lk 4:18, Isa 61:1-2, Isaiah 42:1, 59:21, Isa 11:2-note) and with power (dunamis), and how He went about doing good, and healing all who were oppressed by the devil; for God was with Him." (1) Jesus defeated temptation filled with Spirit and filled with the Word the "sword of the Spirit which is the Word of God" (Eph 6:17-note). By His victorious example, Jesus has shown us the secret for triumph in times of temptation---the Word and the Spirit (cp Ro 8:13-note)! (2) Jesus carried out His powerful ministry in dependence on the Holy Spirit and His power (dunamis). How are we carrying out the ministry God has given us -- with the arm of flesh (2Chr 32:8) or the strong arm of the Lord (Ps 89:13, Isa 62:8)? Comment - Without supernatural power, we can do absolutely nothing of eternal significance (cp Jn 15:16, 15:8). As Jesus said "I am the vine, you are the branches; he who abides in Me, and I in him, he bears much fruit; for apart from Me (separate from the enabling power of the Spirit of Jesus) you can do (Greek = absolutely) nothing." (Jn 15:5) Being saved is not a matter of what we do for God, but is what God does through us as we allow His Spirit to empower His ministry in and through us. Stated another way, the human spirit fails us unless the Holy Spirit fills us. John MacArthur adds "A Christian can accomplish no more without being filled with the Holy Spirit than a glove can accomplish without being filled with a hand. Anything he manages to do is but wood, hay, and straw that amounts to nothing and will eventually be burned up (1Cor. 3:12-15). Functioning in the flesh produces absolutely nothing of spiritual value." Let's join the 11 tremulous disciples in the upper room the night before the Cross, the night Jesus told them that He would go away (Jn 13:33, 36, 14:2-4, 12, 28, 16:5). Last words! The last words of anyone are worth listening to especially if they are the last words of Jesus (John 13:1-16:33 = His last words before His crucifixion). John 14:12 “Truly, truly, I say to you, he who believes in Me, the works that I do, he will do also; and greater works than these he will do; because I go to the Father (cp Jn 7:38-39-note;, Jn 16:7 below). In Chris Tomlin's spiritual song God of this City there is a line that echoes Jesus' prophetic promise that "greater things have yet to come, and greater things are still to be done in this city." Question: Do you want to be a body of Christ in this city about which it is said they “have turned the world upside down” (Acts 17:6KJV) for the glory of Jesus the King? I do! Then we must determine to jettison dependence on men's methods and stay desperate for the Spirit's power, for only by His supernatural dunamis can we expect to do "greater things… in this city"! John 14:26 “But the Helper (parakletos), the Holy Spirit, Whom the Father will send in My Name, He will teach you all things, and bring to your remembrance all that I said to you. John 16:7 But I tell you the truth, it is to your advantage that I go away; for if I do not go away, the Helper (parakletos) shall not come to you; but if I go, I will send Him to you. John 7:37-39-note Now on the last day, the great day of the feast, Jesus stood and cried out, saying, “If any man is thirsty, let him come to Me and drink. 38 “He who believes in Me, as the Scripture said, ‘From his innermost being shall flow rivers of living water.’” 39 But this He spoke of the Spirit, whom those who believed in Him were to receive; for the Spirit was not yet given, because Jesus was not yet glorified. What was the "church growth strategy" for the Spirit Filled Church in Acts? Dear reader don't you long to be a part of such a Spirit Filled, Spirit Empowered Church in the twenty-first century! Jesus promised His Spirit would do greater works! God has done great things before and He can do them again. He is looking for churches emptied of self and filled with the Spirit, so that He alone gets the glory! Conclusion: The potential for the Spirit filled church is a greater harvest of souls then Jesus Himself is His 3 year ministry. Why? Because the Holy Spirit not just in one person but in every member of the body. To strengthen, save, and make us whole. As we yearn to yield more to the Spirit of Christ we will encounter increased resistance from the world, our fallen flesh and the devil, so let us pray without ceasing (1Th 5:17-note, Eph 6:18-note) for ourselves and for one another Paul's prayer for the saints at the church in Ephesus (Eph 1:18-19). Notice that he is not praying for them to be filled with the Spirit per se, to receive more of the Spirit, to be baptized with the Spirit or to experience what some refer to as a second blessing. No, he is praying for the eyes of their hearts to be opened to the vistas of the great riches they already possess in Christ (cp "every spiritual blessing in the heavenly places in Christ" - Eph 1:3-note). In short, he is praying for these saints to possess their possessions, to possess what God has already promised them and made available for them in Christ through His Spirit. How do they possess their possessions? Ultimately by faith and obedience. (See study of relationship between faith and obedience) Or as the old hymn says "Trust and obey for there's no other way to be happy in Jesus, then to trust and obey." As former Wheaton College president V. Raymond Edman used to say "The Spirit-filled life is no mystery revealed to a select few, no goal difficult of attainment. To trust and obey is the substance of the whole matter." So as a body let us boldly approach the throne of grace (Heb 4:16-note) and pray Paul's great prayer. What might God do with His church if we kept on asking, kept on seeking, kept on knocking (Mt 7:7-note)? What would (could) God do with a truly Spirit filled Church? What clues do we see in the Spirit filled church in the book of Acts? Would you like to be part of a Spirit filled Church? SPIRIT FILLED CHURCHES – Have the Spirit's power enabling them to suffer joyfully, courageously and victoriously (Acts 5:41, Stephen in Acts 7:55-58, 1Thes 1:6-note). SPIRIT FILLED CHURCHES -- Are generous churches (with a heart of charity) whose members are seek to meet the needs (chreia) of others in the body of Christ. (Acts 2:44-45, Acts 4:34-37). C H Spurgeon on Ps 42:2 - My soul. All my nature, my inmost self. Thirsteth. Which is more than hungering; hunger you can palliate, but thirst is awful, insatiable, clamorous, deadly. O to have the most intense craving after the highest good! this is no questionable mark of grace. For God. Not merely for the temple and the ordinances, but for fellowship with God himself. None but spiritual men can sympathize with this thirst. For the living God. Because he lives, and gives to men the living water; therefore we, with greater eagerness, desire him. SPIRIT FILLED CHURCHES – Continually express gratitude to God the Father (always, in all things) rather than grumbling and complaining. (Eph 5:20). SPIRIT FILLED CHURCHES – Are enabled by the Spirit to walk wisely (Eph 5:15), to redeem the time (Eph 5:16) and to understand the will of God (Eph 5:17). SPIRIT FILLED CHURCHES -- Are characterized Spirit filled marriages (Eph 5:22-31-note), Spirit filled families (Eph 6:1-4-note), Spirit filled workplaces (Eph 6:5-9-note), Spirit empowered warfare (Eph 6:10-17-note), Spirit initiated prayer life (Eph 6:18-note) and Spirit given boldness to bear witness of the Gospel of Jesus Christ (Eph 6:19-20-note). Comment: Sadly many believers do not realize that in every area of our life, we are continually in desperate need of the power of the Spirit, Who alone enables us to live life and live it abundantly in Christ and for Christ (Jn 10:10)! SPIRIT FILLED CHURCHES – Are supernaturally empowered to engage in spiritual warfare (Acts 13:9-10). SPIRIT FILLED CHURCHES – Attract outsiders not to come see their programs but the One the Spirit is exalting. Comment: Indeed we are commanded to be the light of the world, but the switch must be turned on to allow the power of the Spirit to flow! (Mt 5:16-note, Php 2:15-note). SPIRIT FILLED CHURCHES -- Are filled with supernatural joy (Acts 5:42, Acts 13:52, Acts 8:39, Acts 11:23, 16:34, 1Thes 1:6-note). Filled (4092) (pimplemi from the obsolete pláō = to fill) to fill, to make full, to complete. Of literal filling - of a wedding hall = Mt 22:10, of a sponge = Mt 27:48, Jn 19:29, Lk 5:7 = of boats. Of skins or jars filled with water in Septuagint (Lxx) of Ge 21:19, Ge 24:16). Figuratively of persons filled with something which means they are wholly affected, controlled or influenced with or by what fills them, especially the Holy Spirit (Lk 1:15 = of John the Baptist while still in mother's womb, Lk 2:4, Acts 4:8 = of Peter, Acts 4:31 = the praying believers, Acts 9:17 = of Paul, Acts 13:9 = of Paul). Filled with an emotion (Lk 4:28, Lk 6:11 = filled with rage, Lk 5:26 = filled with fear, Acts 3:10 = wonder and amazement, Acts 5:17 = jealousy, Acts 13:45 = Jews filled with jealousy, compare Acts 19:29 = city filled with confusion). Of time fulfilled or completed (Lk 1:23 = days of priestly service ended, Lk 1:57, 2:6 = pregnancy completed, Lk 2:21-22, Lk 21:22. One of my favorite uses of this verb (other than being filled with the Spirit) is found in the prophecy in Habakkuk 2:14-note "For the earth will be filled (Hebrew = male= to be full; Lxx = pimplemi) with the knowledge of the glory of the LORD, As the waters cover the sea." And another verse that speaks of the glorious hope we have at Messiah's Second Coming and establishment of His Millennium (Messianic) Kingdom. "I will shake all the nations; and they will come with the wealth of all nations, and I will fill this house (Millennial Temple - read Ezek 43:2-4, 5) with glory,' says the LORD of hosts." (Haggai 2:7) And all God's children shout "Hallelujah-Praise the Lord!" Pimplemi - Usage: come(1), completed(2), ended(1), filled(18), fulfilled(1), passed(1). Matthew 22:10 "Those slaves went out into the streets and gathered together all they found, both evil and good; and the wedding hall was filled with dinner guests. Matthew 27:48 Immediately one of them ran, and taking a sponge, he filled it with sour wine and put it on a reed, and gave Him a drink. Luke 1:57 Now the time had come for Elizabeth to give birth, and she gave birth to a son. Luke 2:21 And when eight days had passed, before His circumcision, His name was then called Jesus, the name given by the angel before He was conceived in the womb. Luke 5:7 so they signaled to their partners in the other boat for them to come and help them. And they came and filled both of the boats, so that they began to sink. Luke 6:11 But they themselves were filled with rage, and discussed together what they might do to Jesus. Luke 21:22 because these are days of vengeance, so that all things which are written will be fulfilled. Acts 13:45 But when the Jews saw the crowds, they were filled with jealousy and began contradicting the things spoken by Paul, and were blaspheming. Ge 6:11 Now the earth was corrupt in the sight of God, and the earth was filled (Hebrew = male= to be full; Lxx = pimplemi) with violence. Ge 6:13 Then God said to Noah, “The end of all flesh has come before Me; for the earth is filled (Hebrew = male= to be full; Lxx = pimplemi) with violence because of them; and behold, I am about to destroy them with the earth. Genesis 26:15 Now all the wells which his father's servants had dug in the days of Abraham his father, the Philistines stopped up by filling (Hebrew = male= to be full; Lxx = pimplemi) them with earth. Genesis 44:1 Then he commanded his house steward, saying, "Fill (Hebrew = male= to be full; Lxx = pimplemi) the men's sacks with food, as much as they can carry, and put each man's money in the mouth of his sack. Psalm 65:4 How blessed is the one whom You choose and bring near to You To dwell in Your courts. We will be satisfied (Hebrew = saba = to be sated or filled; Lxx = pimplemi) with the goodness of Your house, Your holy temple. Psalm 88:3 For my soul has had enough (Hebrew = saba = to be sated or filled; Lxx = pimplemi) troubles, And my life has drawn near to Sheol. Psalm 123:4 Our soul is greatly filled (Hebrew = saba = to be sated or filled; Lxx = pimplemi) With the scoffing of those who are at ease, And with the contempt of the proud. Proverbs 1:31 "So they shall eat of the fruit of their own way And be satiated (Hebrew = saba = to be sated or filled; Lxx = pimplemi) with their own devices. Proverbs 3:10 So your barns will be filled (Hebrew = male= to be full; Lxx = pimplemi) with plenty And your vats will overflow with new wine. Proverbs 12:14 A man will be satisfied (Hebrew = saba = to be sated or filled; Lxx = pimplemi) with good by the fruit of his words, And the deeds of a man's hands will return to him. Proverbs 12:21 No harm befalls the righteous, But the wicked are filled (Hebrew = male= to be full; Lxx = pimplemi) with trouble. Daniel 3:19 Then Nebuchadnezzar was filled with wrath, and his facial expression was altered toward Shadrach, Meshach and Abed-nego. He answered by giving orders to heat the furnace seven times more than it was usually heated. Micah 6:12 "For the rich men of the city are full (Hebrew = male = to be full; Lxx = pimplemi) of violence, Her residents speak lies, And their tongue is deceitful in their mouth. Add (added, proceeded) (4369)(prostithemi from pros = to, toward, besides + tithemi = to place) literally means to "put to" or "to place beside" and is used literally of adding something to an existing quantity. The most exciting uses of prostithemi in the NT are in Luke's description of the supernatural addition of souls to the Kingdom of God (of persons added to a group already existing and to whom they henceforth belong) (Acts 2:41, Acts 2:47, Acts 5:14, Acts 11:24). Paul uses prostithemi to describe the the Law added "because of transgressions." (Gal 3:19) (See discussion below). The writer of Hebrews uses prostithemi to describe the Israelites at Mt Sinai who heard the sounds of God at Mt Sinai and begged for no more words "be added" (~be spoken) (Heb 12:19). Many of the NT uses of prostithemi are figurative and speak of something which added or increased such as an hour to our life (Mt 6:27, Lk 12:25), all the things we need for life and godliness (Mt 6:33, Lk 12:31), Herod's crimes or sins against God (Lk 3:20), or faith (a prayer for more) (Lk 17:5). Several uses of prostithemi in context mean to proceed (Lk 20:11, 12, Acts 12:3, cp Lk 19:11). Mounce says "from the Hebrew, denote continuation, or repetition." In Lxx of Lev 5:16-note describing the restitution in the Trespass (Guilt) Offering (Lev 5:14-6:7) - "he… shall add (Heb = yasaph - to add; Lxx = prostithemi) to it a fifth part of it and give it to the priest." TDNT - 1. In secular Greek this means “to put to,” “to add to,” “to shut,” middle “to attach oneself to,” “to win,” “to join” (cf. also “to win over”). 2. In the LXX we find Hebraizing in many of the references (cf. Gen. 4:2; 25:1). Elsewhere the usage is similar to that of secular Greek. 3. a. There are some Hebraisms in the NT (cf. Lk. 19:11). “adding to” is the meaning in Mk. 4:24; Heb. 12:19; Lk. 3:20; Mk. 6:27; Mt. 6:33 (unless “give” is the sense here). b. The idea of “adding” suggests that the law is simply an interlude in Gal. 3:19.
c. The adding of people (to the church) is the point in Acts 2:41, 47; they are added to the Lord in 5:14 and 11:24. Prostithemi - 18x in 18v - NAS Usage: add(2), added(6), adding(1), brought(1), further… be spoken(1), increase(1), laid(1), more will be given… besides(1), proceeded(3), went(1). Matthew 6:27 "And who of you by being worried can add a single hour to his life? Matthew 6:33 "But seek first His kingdom and His righteousness, and all these things will be added to you. Luke 3:20 Herod also added this to them all: he locked John up in prison. Luke 12:31 "But seek His kingdom, and these things will be added to you. Luke 19:11 While they were listening to these things, Jesus went on ("added" or "proceeded") to tell a parable, because He was near Jerusalem, and they supposed that the kingdom of God was going to appear immediately. Comment - This is a Hebraism denoting continuation or repetition when followed by an infinitive, literally add to do something, i.e. do again, do further. Luke 20:11 "And he proceeded to send another slave; and they beat him also and treated him shamefully and sent him away empty-handed. Luke 20:12 "And he proceeded to send a third; and this one also they wounded and cast out. Acts 2:41 So then, those who had received his word were baptized; and that day there were added (aorist tense = past completed action; passive voice = God produces the supernatural fruit = "divine addition! "; indicative mood = mood of certainty = there is no doubt 3000 souls were miraculously added in one day!) about three thousand souls (Don't you love it! Luke was not inspired to say "people" but souls! Our Father is passionate for the souls of people to be with Him forever! Compare 2Pe 3:9-note; 1Ti 2:4). Comment - Was adding is in the passive voice with God's Spirit as the implied acting Agent and so it is only fitting that this genre of usage is often referred to as "divine passive." Cliff McManus - The word for “added” (prostithemi) here is a very specific compound Greek word meaning “placed into” and speaks of a deliberate, calculated act of adding a select number to a greater, existing whole. In other words, the early church was keeping a careful count of those who were being added as new members to the body. (Christian Living Beyond Belief: Biblical Principles of Life and Faith). Acts 2:47 praising God and having favor with all the people. And the Lord was adding (literally = "were being continually added" = imperfect tense = over and over, again and again, portrays an action in process; active voice = subject [Lord] accomplishes this action; indicative mood = mood of certainty = there is no doubt this action occurred!) to their number day by day those who were being saved. Comment - Added is a term used in early Jewish proselyte literature to indicate being gathered to or joining a fellowship, implying a break with a former community -- e.g., Gentiles being joined to Israel as used in the Lxx of Esther 9:27 "for all those who allied (Hebrew = lavah = to join or be joined; Lxx = prostithemi) themselves with them." We see a similar sense in the Lxx of Isaiah 14:1 "When the LORD will have compassion on Jacob and again choose Israel, and settle them in their own land (Note: this refers to the time of Messiah's return and subsequent reign in the Millennium), then strangers will join (Hebrew = lavah = to join or be joined; Lxx = prostithemi) them and attach themselves to the house of Jacob." Acts 11:24 for he was a good man, and full of the Holy Spirit and of faith. And considerable numbers were brought (KJV, ESV = "added") (literally = "were being continually added" = aorist tense = past completed action; passive voice = God produced the supernatural soul fruit = miraculous "divine addition! "; indicative mood = mood of certainty = there is no doubt this action occurred!) to the Lord. Acts 12:3 When he saw that it pleased the Jews, he proceeded (Young's Literal = "he added") to arrest Peter also. Now it was during the days of Unleavened Bread. Comment - This sense of prostithemi is a Hebraism followed by an infinitive to mark an event that immediately follows = proceed to do. Mounce comments - by this (by the law being "added because of transgressions") Paul is stressing that through the law of Moses we come to a knowledge of our sin (cf. Ro 3:20), which in turn drives us to search for a Redeemer, Jesus Christ. Thus, the law leads us to Christ. Hebrews 12:19 and to the blast of a trumpet and the sound of words which sound was such that those who heard begged that no further (that no word be added) word be spoken to them. Deut 1:11 'May the LORD, the God of your fathers, increase (Hebrew = yasaph - to add; Lxx = prostithemi) you a thousand-fold more than you are and bless you, just as He has promised you! Deut 4:2 “You shall not add (Hebrew = yasaph - to add; Lxx = prostithemi) to the word which I am commanding you, nor take away from it, that you may keep the commandments of the LORD your God which I command you. Leviticus 26:21 'If then, you act with hostility against Me and are unwilling to obey Me, I will increase (Hebrew = yasaph - to add; Lxx = prostithemi) the plague on you seven times according to your sins. Norman Brown in his article on The Filling Of The Holy Spirit In The Book Of Acts wrote that "The book of Acts teaches that being filled with the Spirit was a normal experience in the early church. Those individuals who are mentioned as being filled include: (1) the Apostles and leaders of the church, such as Peter, Barnabas, Paul, and Stephen (Acts 4:8, 11:24, 9:17, 7:55); and (2) the Assembly of the disciples. Those who were “all with one accord in one place” on the day of Pentecost were simple disciples, whose names are not even all recorded (Acts 2:1, cf. Acts 1:15); yet all 120 of them were filled (Acts 2:4). The assembly numbered 5,000 as it gathered to welcome back Peter and John after their first arrest; and, again, all were filled (Acts 4:4, 31). Individuals who were filled included also (3) the newly converted. Acts 9:17 reveals that Saul of Tarsus was filled with the Spirit three days after meeting Christ. Another example of new converts experiencing this work of the Spirit occurs in Acts 13:52. In this verse, the disciples at Antioch in Pisidia—to whom Paul had preached for only a few weeks at most—were “filled with joy, and with the Holy Ghost.” In all of these instances, the Holy Spirit is ministering to individuals without deference to their spiritual maturity or position within the church. The Spirit filled not only the church leaders, but also the “ordinary” Christians in “ordinary” Christian service. According to W. H. Griffith Thomas, “The true interpretation would seem to be that all the disciples, and not the Apostles only, were filled with the Holy Spirit. The narrative does not warrant the view that the Apostles alone were the recipients of the gift.” Thus, any Christian, however immature, could be a recipient of this work of the Spirit upon meeting its conditions. In addition to teaching the normalcy of Spirit-filling, the book of Acts also avers that this filling is instantaneous. On Pentecost, for example, in the very moment the Spirit descended upon them, the disciples were filled. The 5,000 were filled in a similar fashion (Acts 4:31). Each case in Acts bears witness to the fact that the Holy Spirit is able to fill individuals, as they are, to the measure of their capacity, instantaneously. The most distinguishing feature of this filling, however, is that it is a repeated experience. Again, one need only compare Acts 2 with Acts 4 to verify that the same group which was filled on the Day of Pentecost was involved in a second filling only days later; the majority (if not all) of the 120 were among the 5,000 who, after the prayer meeting held subsequent to the Sanhedrin’s questioning, “were all filled with the Holy Ghost” (Acts 4:31). Thus, these Christians were not necessarily filled once and for all: fulness could last or be repeated.